You are here: Home / Blog / Roofing / Roof Anatomy: Why Do Fascia Boards and Soffits Matter? Fascia boards are the vertical panels that cover the roof’s eaves and gable ends. Nailed directly to rafters, their duty is to prevent wind and water, as well as critters, from getting inside. They weatherproof the edges of the roof. Considering their job description, it’s easy to imagine that they constantly take a beating from nature. They’re usually made from solid-wood lumber protected by a water-resistant finish. Other materials can also be used to help repel moisture and help reduce your roof repair costs. 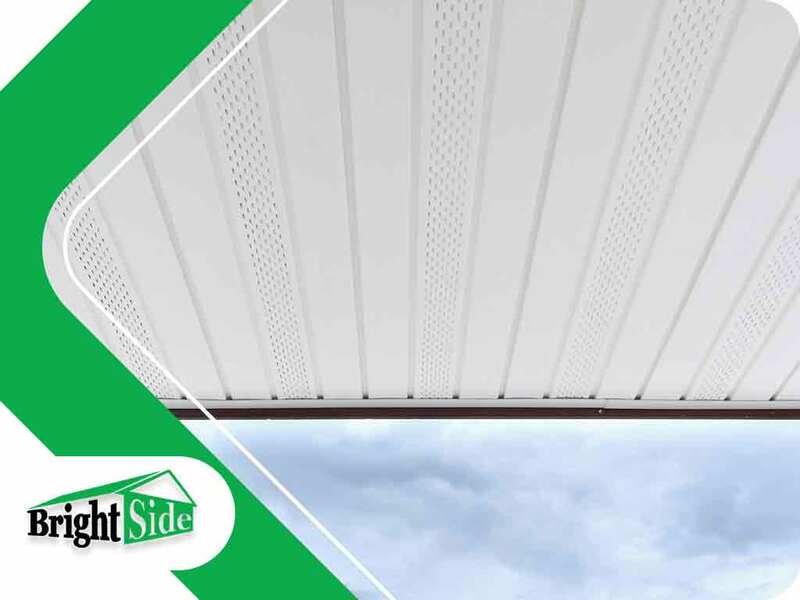 In addition to shielding the roof interior from the elements, fascia boards also serve as the foundation on which gutters and downspouts are installed. When structurally unsound, your roof’s drainage system will be effectively compromised. Soffits likewise prevent the water from blowing into the interior, but they have a unique purpose: intake ventilation. Some soffit panels are perforated to admit drafts. The cool air enters the rafter bays, allowing it to travel up and exit through exhaust vents at the roof peak. Seasoned roofing companies say that older homes don’t rely on soffit for ventilation; rather, they use gable vents. However, the strategic location of the soffits makes them more efficient. They optimize natural air convection to help keep the roof’s temperature as close to that of the outside air as possible. In turn, they prevent heat buildup in the summer and inhibit ice damming in the winter. Learn about the rest of the roof anatomy. Call Bright Side Exteriors at (302) 724-4342 to discuss your roofing project, explore different product options and get a free estimate. We proudly serve homeowners in Delaware, particularly in Middleton.